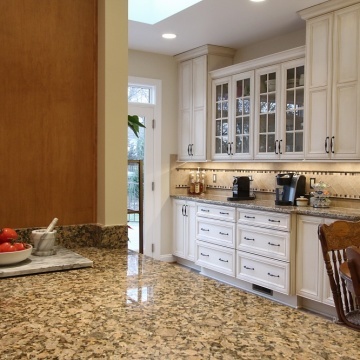 Serving Northern Virginia for over 30 years, NVS Kitchen and Bath is a full-service design build remodeling firm - delivering expert designs and craftsmanship to every project. Our design staff will work with you to create the perfect plan, and our in-house production staff will ensure your space is professionally built with an attention to detail. 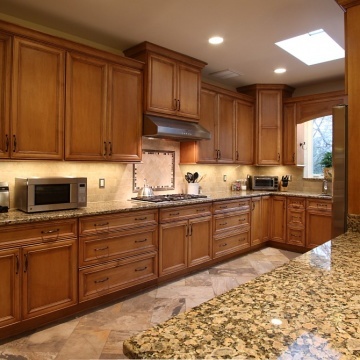 Based in Manassas, Virginia, NVS' remodeling team boasts of one of the largest selections showrooms in Northern Virginia with a wide range of kitchen and bathroom displays and hands-on selections for countertops, flooring, and fixtures. 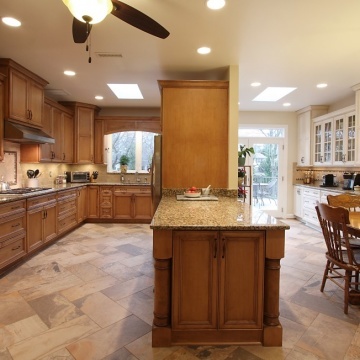 NVS Kitchen and Bath serves Fairfax County, Arlington County, Loudoun County, and Prince William County in the areas of Northern Virginia providing homeowners with kitchen remodeling, bathroom and powder room remodeling, additions and bump outs, exterior renovations like screened-in porches and decks, to basement refinishing and wine cellar installation. 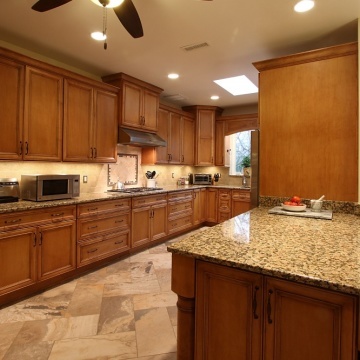 NVS also provides full home renovation. Everyone that “touched” us. Dave, Jessica, Casey, Todd,all of the service partners, the experts at the tile store, granite place, Ferguson. I have recommended NVS to 2 other potential clients. NVS does an outstanding job, uses high quality products as well as very competent employees. NVS built our kitchen 11 years ago, and it is gorgeous today, only because they rebuilt it this spring after it was severely damaged by a broken water pipe. Sean, their lead carpenter, is an architect, so he had a thorough understanding of what needed to be done. Dave, Julio, Gary, and Sean all did great work. This is the third project I've had NVS Kitchen and Bath do in my house and it turned out beautifully. Enjoyed working with the team who is personable and professional. All issues were addressed and resolved. NVS knows how to work on townhouses and smaller houses. Dave Paccassi was great about staying in touch and was understanding when a family emergency caused us to push back the project. I've worked with Alison on all the projects in my house and always appreciate her perspective and opinion on color and material choices. She listens to what I'd like to do with the space and then makes the appropriate suggestions. Dave Harris was wonderful to work with. He explained what was happening at every stage of the project and was happy to answer questions. 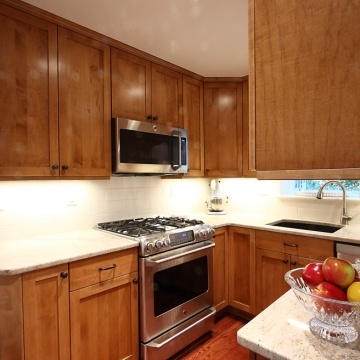 NVS always does an excellent job, which is why we have used them for every renovation job in our home. NVS is a terrific firm to work with, their professionalism made our project low stress and the outcomes were incredible. We have an older house in Old Town Alexandria, and they did a great job budgeted for this project given the age and unknowns in our house. The lead carpenter was fantastic, he communicated daily with us what to expect, and his craftsmanship was outstanding. 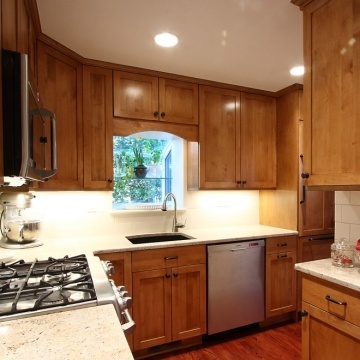 NVS works with trades that perfectionists and did outstanding work in our home. 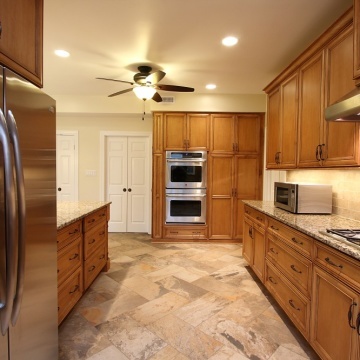 We highly recommend NVS based upon the work they did for our home. Sean Gooden was fantastic, we cannot say enough nice things about how great Sean was and how he shepherded our project. He did great work. Alison Martin did a great job guiding us through the selection of our countertop, cabinet base, drawer pulls, faucets, etc. Dave Harris was on the job every day, kept us up to date on what was being done and what the plan was for the next day. At the end of every day he would sweep from the job site (the master bath) all the way to the front door, leaving the entire area clean. On the first day the floors from the front door all the way to the master bath were covered with a protective cover. A HEPA filter was used anytime dust was created, the bathroom door was sealed with tape to prevent drywall dust from escaping. I was most satisfied with the lead carpenter. He was very responsive and talented. He had great communication skills. The woman who did the design did a great job, she knew what we wanted better than we did. We wound up with something much better than we could have done on our own. The design is perfect. I would like to recognize the lead salesman Mr. Piccassi for his exceptional service. He was great through the whole process, he made sure everything was going to happen and was of good quality. Response to concerns. Appreciated Richards expertise and recommendations. Casey was great in communicating and also making recommendations. We had no surprises during the process. Everyone was very open and honest. They showed up and worked really long and hard everyday. They kept their word, which is really nice. Everyone was extremely courteous. Our questions were answered promptly. It was a great experience to work with NVS. Tod, the lead carpenter was always keeping us informed as to what was being done and any changes in the schedule. He was helpful in agreeing to a schedule and kept us informed every step of the way. Quality of service from all we interacted with--from sales to design to construction. NVS met all our expectations with courtesy and professionalism. All the tradesmen were top notch. Richard's exceptional expertise in solving design problems because of TV placement over the fireplace was indeed 'exceptional'. The finished look is very professional. Everything! I am loving my new kitchen. Dawn did a great job working the design with me and Tony, my lead carpenter, took care of all my needs. The process for design and build worked very well. This contributed to an overall excellent project experience. All staff were professional and a pleasure to work with. Everyone I came in contact with at NVS was a pleasure to work with. Dave and Alison on the front end were wonderful in helping me make choices and were very supportive in the process. Sean could not have made life during construction any easier. He was considerate of our home and us, professional, responsive to concerns, kept us informed at every step and frankly, is just a really nice guy. We will miss him! As Dave Pacassi predicted, this project changed our lives for the better. Lead Carpenter Richard Wright. 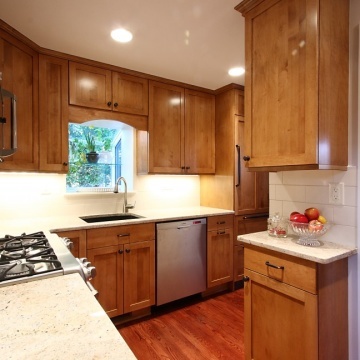 He had the professional knowledge and experience to effectively explain issues and options to the homeowners. He did a great job in managing the project. Plus he had the right temperament to deal with one subcontractor who had upset the homeowner. In the end, Richard helped all parties worked through the issues and satisfactorily address build issues. Dawn Summers also has a keen sense of design and helped the homeowners tremendously. 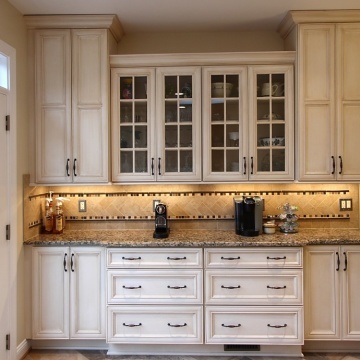 The project would not have turned out so well without her input and guidance especially in the cabinetry, floor tile, lighting fixtures and hardware areas. 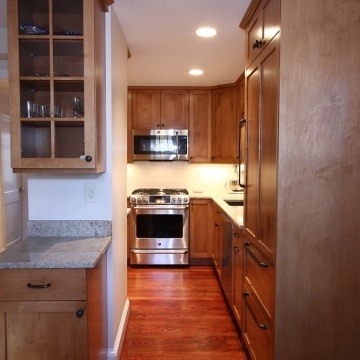 We were extremely pleased with NVS Remodeling and Design. The entire firm is very professional and know their craft. They stressed communications and they live it everyday. We were very pleased with ALL of the NVS staff who participated in our remodel project. 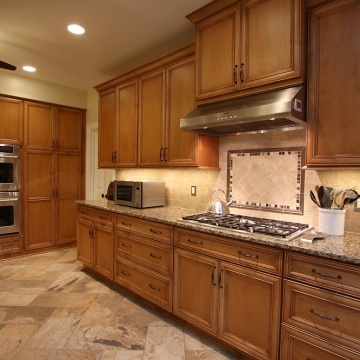 We would not think twice about using another remodeler should the opportunity present itself. We would be glad to share our experience with any potential NVS client. Tony Seal, my lead carpenter went above and beyond. He is an easy to work with perfectionist. My salesman, Dave Pacassi, also followed through to resolve any issues that he could. The company explained advantages and costs of things that were suggested. There were also a lot of small touches that I did not ask for and there was a lot of attention to detail. The lead carpenter also took the extra step. I was very satisfied with the lead carpenter and the salesperson. I needed a new storm door and he went with me to buy one, and that is something that was not part of the job. I felt very respected and taken well care of. It was a long process but they made it easy cause they were such a nice group to work with. I felt like they always tried to give us quality work and we intend to use them again. The designer Dawn Parker listened very carefully to what we asked for. She had creative suggestions to solve our space & flow issues. Our salesman- Dave Pacassi was knowledgeable & professional. He walked us thru the process so we were able to understand the whole picture and the details. A bonus was Dave's sense of humor. Great, kind people to work with along the way. Reliable, trustworthy. Overall, having the support along the way - though every step was huge because it gave us comfort that things were done right, and that our investment was safe. 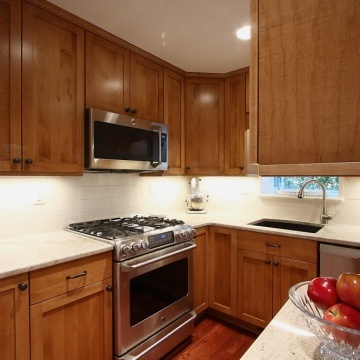 NVS Remodeling and Design absolutely did not fall short of our expectations. We were extremely extremely pleased with them, and it is beyond words. We have never experienced service like this before when it came to a contractor. We were most satisfied in terms of their quality, reliability, and in that they took ownership of any kind of hiccup or anything unexpected. We were satisfied overall with their professionalism. I was most satisfied with the sales, the design of the kitchen and the interest of the owner of the company. I was most satisfied that there was somebody from NVS in my home anytime there was a contractor in my home. They are fantastic! It was wonderful working with them. They always put me at ease when I had concerns and listened to what I wanted.